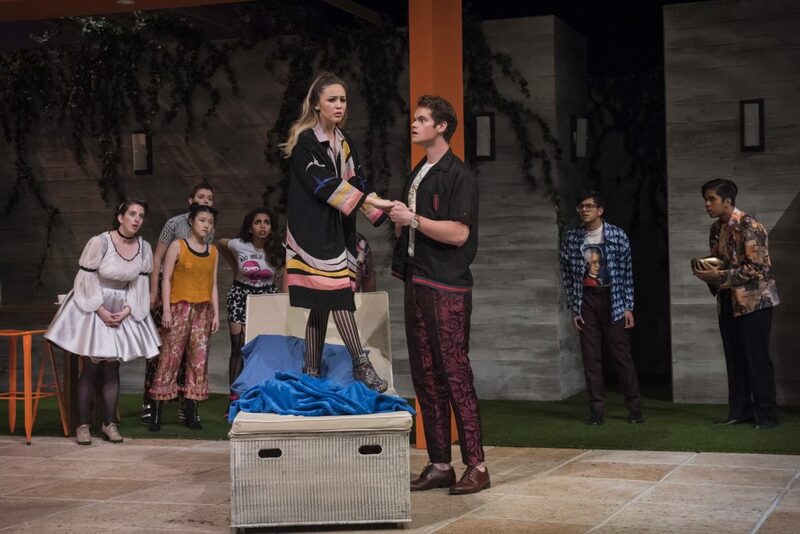 Cal’s production of Moliere’s “Tartuffe” turns out to be glamorous and modern, with amazing sets. The stage is filled by a backyard pavilion in full L.A. splendor, glowing with excess and luxury. There’s a huge outdoor TV, a fireplace surrounded by cushy lawn chairs, and a juice bar! To grab the spirit of Dominique Lozano’s “Tartuffe,” imagine an Instagram Influencer or You Tube Star speaking in poetic verse. When several characters use an Amazon Echo to speak with Alexa, “Tartuffe” is convincingly thrust into the modern world. 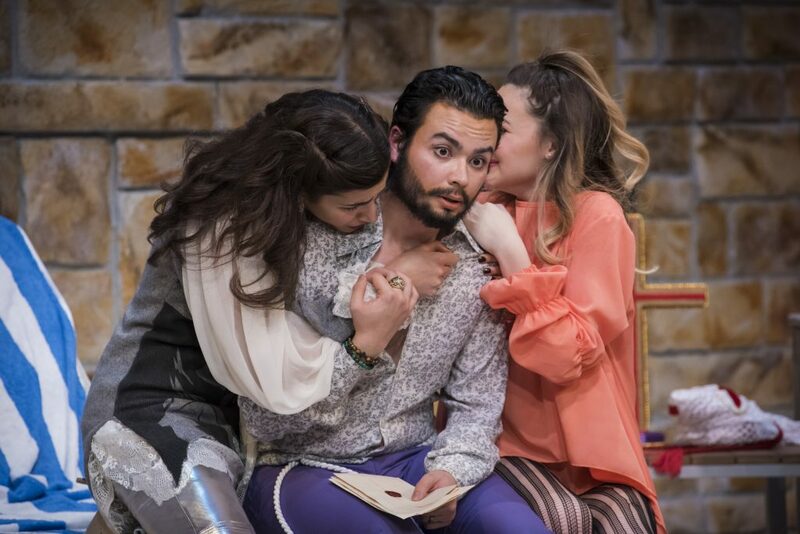 It turns out that Moliere feels fresher than ever onstage at the University of California, Berkeley. The modern elements of the script blend smoothly with Richard Wilbur’s verse, cellphones, and electric scooters. Naive Orgon (impressive Drew Woodson), a rich and ignorant gentleman, has taken in a con-man, Tartuffe (delightful Shea Nolan). 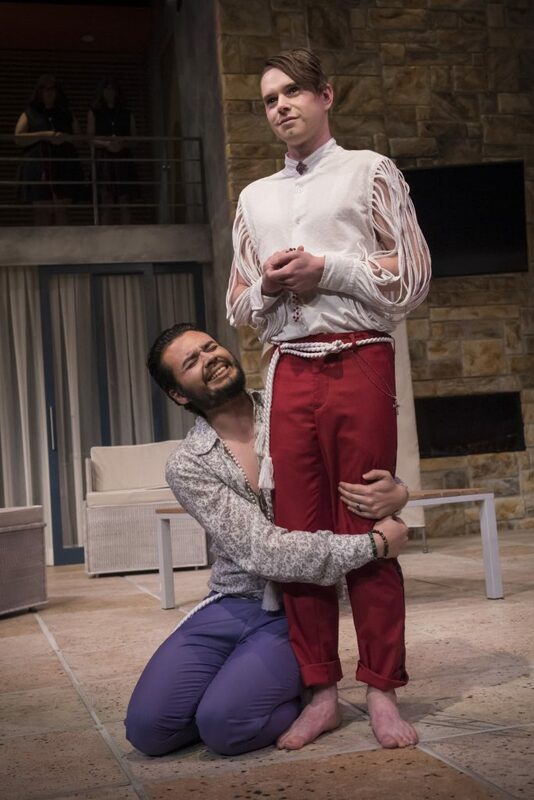 Tartuffe claims to be an ultra-pious clergyman, and Orgon believes it all. While Orgon’s extended family all recognize the fraud, the gullible host continues to believe in Tartuffe’s honesty. 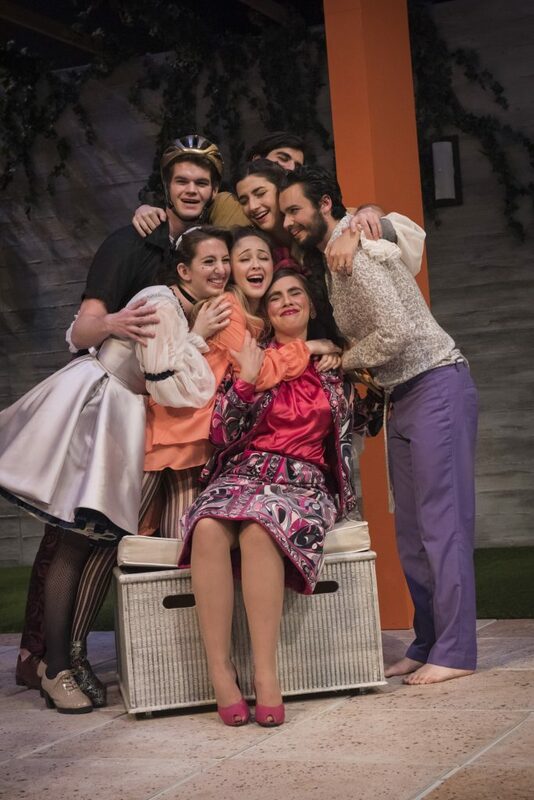 Meanwhile, Tartuffe subjects each spoiled family member to his whims, fancies, and sexual harassment! What follows is an uproarious romp including sexual affairs, cruel deceptions, arranged marriages, and yes, even love. Poet Richard Wilbur’s translation captures Moliere’s wit, particularly during the play’s many take downs and deceptions. In one of the funniest scenes, Orgon’s wife, Elmire (striking Amalia Sgoumpopoulo), desperately tries to prove Tartuffe’s depravity while Orgon hides beneath a table. In another farcial scene, the exasperated maid (sharp Claire Pearson) hilariously tries to reconcile Mariane (sweet Diana Alvarado) and her fiance Valère (lovable Devin Guilfoyle). Imaginative set dressing and props highlight great comedic staging by director Domenique Lozano. As Tartuffe confesses his love for his benefactor’s wife, a changing tent moves comically across the stage, bumping blindly into a table. There’s also a great recurring gag where the TV displays outlandish photo shoots and a sensual video that must have been a blast to film. The fanciful costuming focuses on satin prints in bright blues and pinks—everything pops! Tartuffe and his cohorts are decked out in a Renaissance meets RuPaul vibe. Orgon and the other men wear shirts barely buttoned past the naval, while the women lounge in long, flowing robes. Technical artistry and staging work seamlessly together to create a vibrant and entertaining show. The actors are clearly having a great time onstage, displaying infectious energy. Everyone I saw left the theater with a smile on their faces, marking “Tartuffe” a charming success. Cast: Diana Alvarado, Nidhi Chalgeri, Adam Dada, Devin Guilfoyle, Sofie Herbeck, Anastasia Liu, Ibrahim Mohyuddin, Shea Nolan, Claire Pearson, Amalia Sgoumpopoulou, Angelina Steshenko, David Truong, Stefan Wayne, Arthur Weiss, Arthur Weiss, and Sahel Zargari. Berkeley, comedy, commedia, Domenique Lozano, farce, hypocrisy, Moliere, religion, Tartuffe, U.C.